I can provide these in any grade wood you desire. 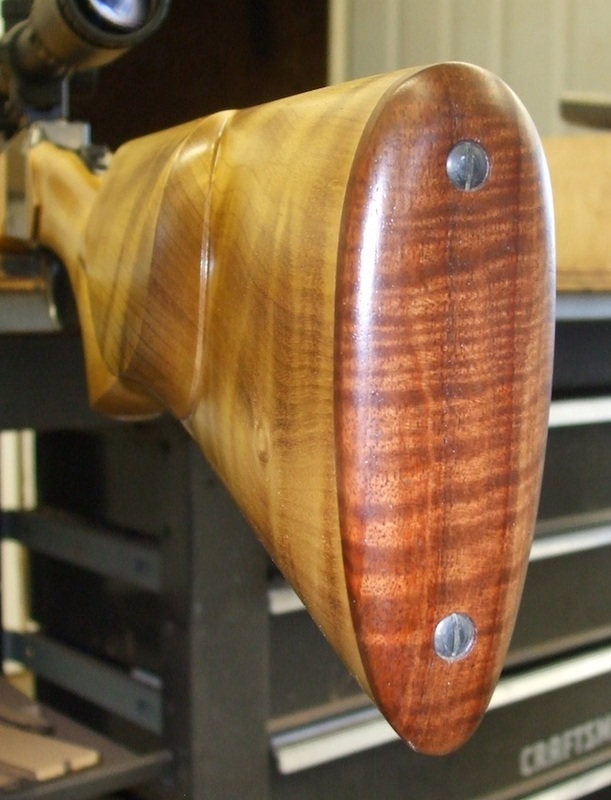 Adding a cheekrest and ebony tip (90.00), as well as wood upgrades increase the cost. Here is a fine example of what I would call an English sporting rifle built by John McGlothin of Raton, NM. John picked a fine piece of California english walnut from my wood inventory that showed perfect layout, displaying a great combination of marble and fiddleback radiating from a crotch. 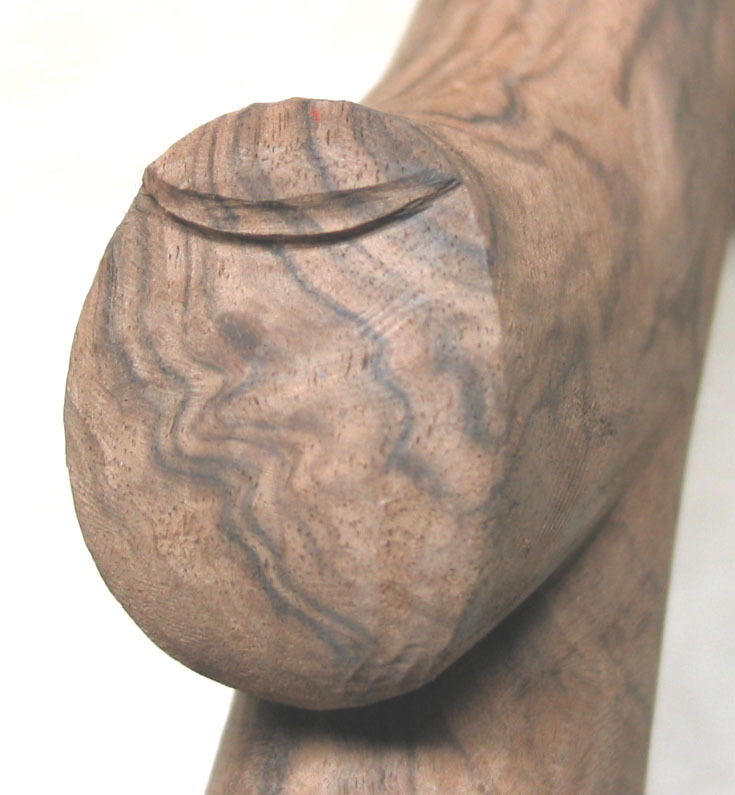 He requested the wood be cut to this pattern with an ebony tip on the forearm. As you can see he did an outstanding job of fitting and finishing. The next picture below, is my english sporting pattern (same pattern as the pic above, but this has a shadowline cheekrest). While the cheekrest is a nice decoration, it does NOT make the comb higher, it just adds a bit of flavor to the stock. Below is a Ruger I with octagon barrel, case colored by Curt Hardcastle. 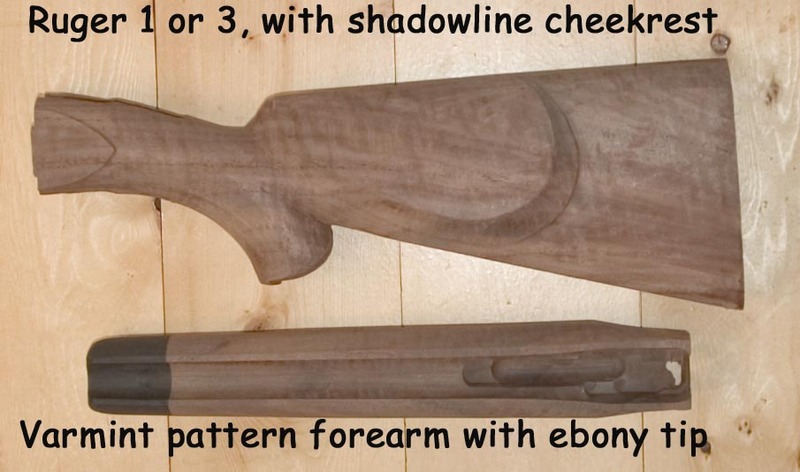 The buttstock is my sporting pattern, and Curt's schnabble forearm pattern with ebony tip. The picture below is customer provided wood. I often get wood sent in by customers to have carved to my patterns. Prices vary a bit, but generally it is 340.00. for a buttstock and forearm, and for the Ruger, an additonal 40. to bore the drawbolt hole. Ebony forearm tips are 90. using my ebony. Ken Hurst (well known for his engraving) sent a spectacular piece of wood to be carved in my Ruger pattern with an A. Henry pattern forearm. Keep in mind that the finished rifle will be engraved and detailed to the maximum. This is a closeup of the detail I put into the grip on this pattern. For lack of a better term, I call this a "thumbnail". This feature is also included on some of my 74 and 78 Sharps patterns. High end custom gunmakers charge big bucks to add this feature. Some day I might decide to do the same, what are you waiting for? This is the english sporting buttstock pattern with cheekrest, with the Ruger International forearm. 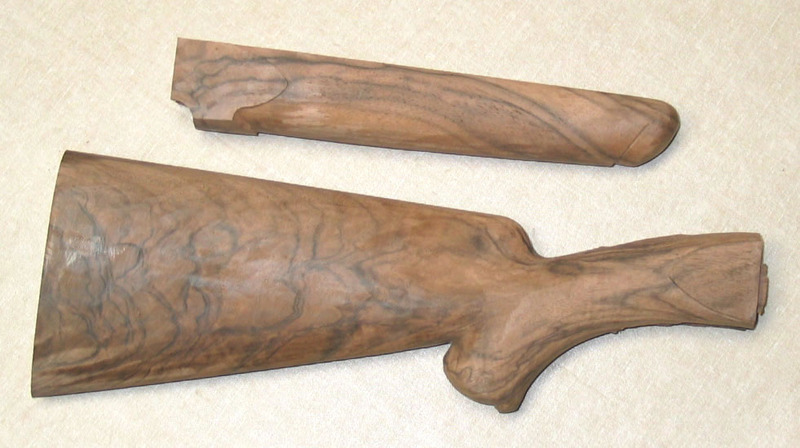 This particular rifle stock is a subtle french walnut, and required a full size bolt rifle blank. The stock shown below is from a pattern built by a customer, sent in for duplication. This will fit a #1 or #3. It is difficult to see in the picture, but it features a nice shadowline cheekrest. Generally I carve these without a buttplate inlet, as I have no idea what buttplate will fit it. A dark Walnut stock on Roy Guidry's stainless #1, a nice contrast of color. Below is a picture of a finished rifle sent in by my customer Geoffrey Wise of Lock, Stock, and Barrel Performance Gunsmithing. This is a Ruger #3 in .25-35 Improved. The wood is high grade Western Quilt Maple. Displaying unique figure, quilt demands your complete attention while fitting and finishing. When done well, it is a traffic stopper. While not the easiest wood to checker due to the contrary grain, Geoffrey managed to pull it off nicely. My customer brought it by the shop after he had completed it. Since I did not offer a bench type forearm, he had me inlet a matched block for him to shape. He also made his own buttplate out of a contrasting wood, shown in the next photo. Myrtle is a nice wood to work, and very stable when properly aged. It is one of the easiest woods to bring to a nice finish. Here is a view of the wood buttplate, these are only limited by your imagination and skill. Ebony makes a very nice buttplate also. Checkering can add a nice touch also. Here is another #3 Ruger (in .17 caliber for New Mexico Prairie dogs). This belongs to BJ of BJ's Shootin Shop of Raton, built for him by John McGlothin also of Raton (John also built the rifle shown at the top of this page.) BJ wanted an affordable piece of wood for the project, this rifle intended for serious use on the local dogtowns.